To what extent is a private moment private? With so many cameras and phones around, pictures and videos have become a much larger part of our lives than before. Candid photos are taken, goofy videos are recorded, and then many of them are put on the Internet, or at least shared with friends. But do you think that you should still have control over what people see and what remains private in your life? Two of my good friends are currently in a fight because of the lax rules our society has surrounding photo privacy. For the sake of privacy (ironically) we will call them Bell and Bae. This entry was posted in OMG Controversy!, Teen Powered and tagged bysplteens, controversy, high school, interpersonal relationships, Photography, photos, privacy, written by teens on May 12, 2015 by Teen Blogger. Hunger Games: Dystopian or Current Events? What does a popular teen dystopian novel and current events have in common? From many people’s perspective, none, because the definition of dystopian is that it is society that is rebuilt/rebuilding from disaster or chaos caused by its citizens and where the people are oppressed greatly by their government and have very limited communication with people outside of their community. But what if what is happening right now in places like the Middle East and even in our own country, is what will cause our nations to submit to a limited way of life like in the Hunger Games, Divergent, or even older dystopian novels like 1984, and Fahrenheit 451. This is a scary thought, but it’s an interesting topic to ponder about as well. When Michael Brown was killed in Ferguson, the citizens where mourning his death and were peacefully protesting before members of the SWAT team were sent over to detain them, but that backfired and created the violence that we see in the news today. Citzens with a curfew set, a no fly zone put on Ferguson, and the fact that limited coverage on this issue is on the news, how does this not look like a page in the Hunger Games? This entry was posted in OMG Controversy!, Opinions, Teen Powered and tagged #ferguson, dystopian, Middle East, The Hunger Games on December 11, 2014 by Teen Blogger. August 9,2014. 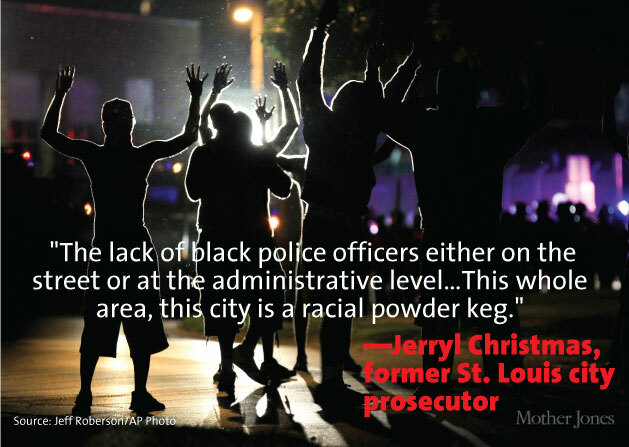 Ferguson, Missouri. 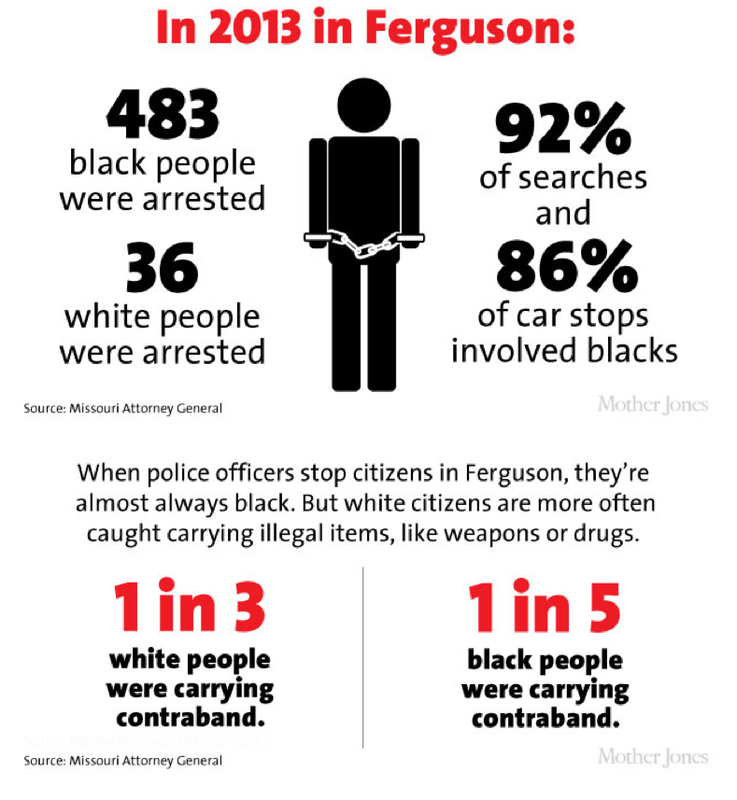 18-year-old unarmed African-American Michael Brown is shot by white police officer Darren Wilson 6 times, killing him. Peaceful protests took place before police in riot gear were sent out to contain the citizens of Ferguson with rubber bullets and tear gas. Others outside of the area turned to social media to get updated on the situation, because news crew were not allowed into Ferguson, and to express their angered thoughts as well. On November 24, 2014, about 100 days after the shooting, Darren Wilson is: declared not guilty, paid $400k, and off on a honeymoon with his wife, leaving many (including myself) who wanted Darren Wilson in jail because his decision to shoot an unarmed teenager who did not even show any brutality towards the officer, but instead put his hands up and pleaded “Dont shoot,” stunned and angered. This past weekend, Darren Willson resigned from the Ferguson Police Department because he was told that keeping his job would put many others at risk, not just himself. While I am glad that he no longer has the power of authority anymore, the fact that he is still a free man while the cells of our country are filled with indiviuals with much pettier crimes than shooting an an unarmed teenager is quite disturbing. We are a nation looked up to by many developing countries and when they see that we let police officers kill unarmed people of color like Michael Brown, Trayvon Martin, Eric Garner, and many more, they start to wonder whether or not they should model their nation after us. Many current pictures of Ferguson are starting to look like the Civil Rights movement from the 50’s and 60’s, which makes me wonder: Are we going to repeat history? This entry was posted in Activism, Community, OMG Controversy!, Opinions, Teen Powered and tagged #blacklivesmatter, #ferguson, african americans, police, racism, social problems, violence on December 5, 2014 by Teen Blogger. The one that most of us don’t even know is happening. 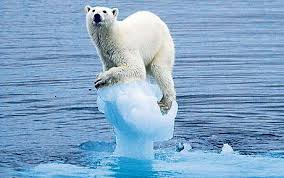 This entry was posted in Activism, Community, OMG Controversy!, Teen Powered, Volunteering and tagged climate change, environment on November 25, 2014 by Teen Blogger. Celebrate our freedom to read! 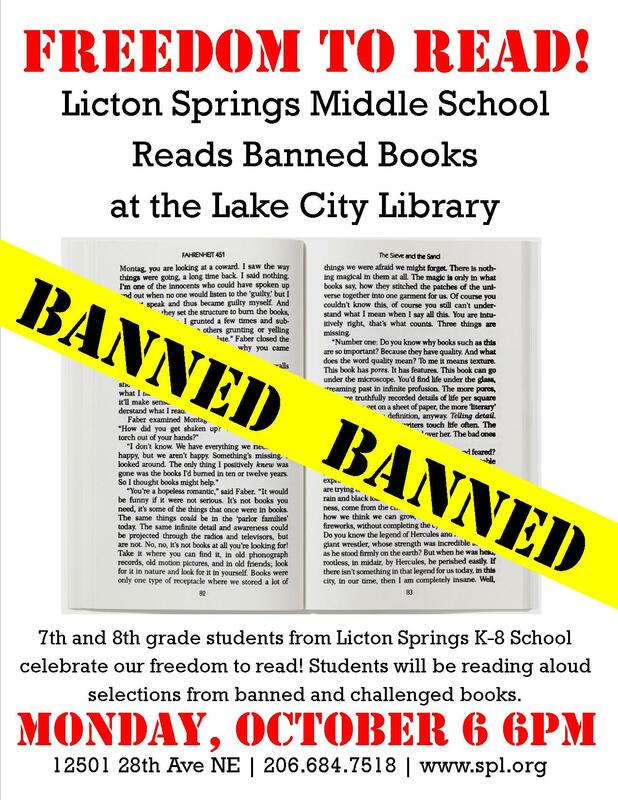 7th and 8th grade students from Licton Springs K-8 School will be reading aloud selections from banned and challenged books at the Lake City Branch on Monday, October 6th at 6 pm. Book selections include excerpts from The Absolutely True Diary of a Part-Time Indian by Sherman Alexie, Geography Club by Brent Hartinger, Bone by Jeff Smith, Wild Swans by Jung Chang, And Tango Makes Three by Justin Richardson, and It Gets Better by Dan Savage. This entry was posted in Censorship, Events, Free Stuff, OMG Controversy!, School News and tagged banned books, Censorship, events, Lake City, Licton Springs k-8 on October 3, 2014 by wbubelis.